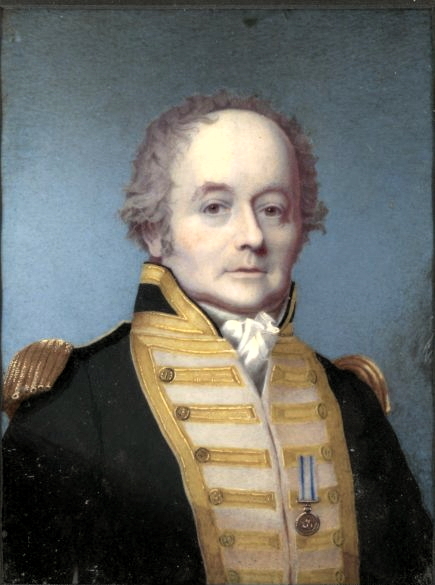 William Bligh. What pictures does the name bring to mind? Susan Page Davis here. I read the Bounty trilogy by Nordoff and Hall when I was in high school and loved it. I always assumed it was pretty much the truth. Now that I've written dozens of historical novels and done more research, I realize that the authors took some liberties with the characters. 1. He was captain of the HMS Bounty when the famous mutiny occurred. 1. He rose in the British Royal Navy to the rank of vice admiral. 2. He was fourth governor of New South Wales, Australia. 3. He was signed up for the Royal Navy at age seven, an age when it was common at that time (1761) to sign on “young gentlemen” so they could gain experience at sea. 4. Captain James Cook chose Bligh as master of one of the ships in his fleet when he made his third voyage to the Pacific. It was during this voyage, ten years before the famous mutiny, that Cook was killed by natives in Hawaii. 5. Between wars (1783-87), Bligh was a captain in merchant service. This was when he met Fletcher Christian, a young sailor he befriended and mentored, teaching him navigation. 6. 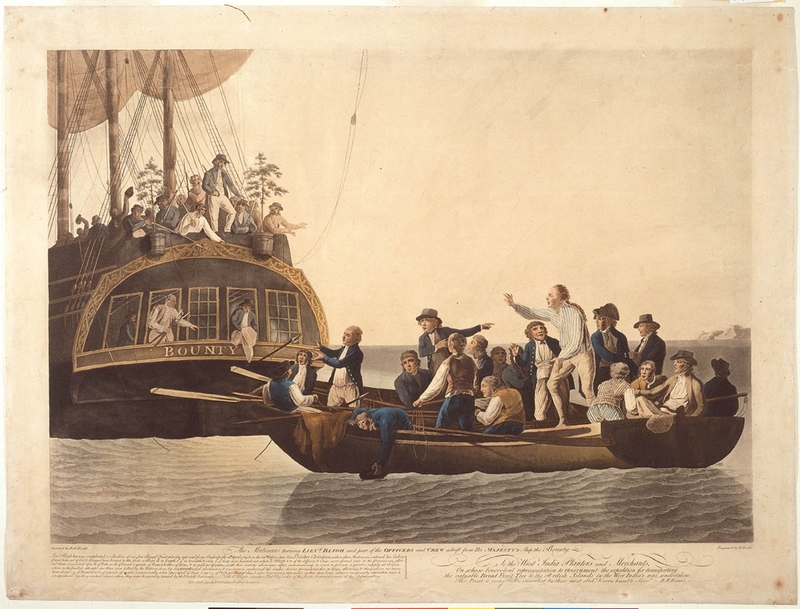 After the mutiny led by Christian in April, 1789, Bligh and his loyal men were set adrift in 23-foot open boat. Under Bligh’s guidance, they sailed 3,618 nautical miles (equal to 6,701 km or 4,164 land miles) without charts to the nearest European settlement at that time, in Timor. They lost only one man, a quartermaster killed by natives when they attempted to stop at an island for supplies. Because of that feat, Bligh is still known today as one of the best navigators ever. He honed his skills while serving under Captain Cook. The voyage to Timor in the small boat seemed impossible, yet in 47 days, he and his men arrived there. How did he do it? When Christian and his cohorts put them adrift, they let Bligh and his men have four cutlasses, a quadrant, a compass, and enough food and fresh water for about a week. Everyone assumed they could make it to an island called Tofua, not far away, and resupply there. But that’s where the hostile natives attacked them and killed the quartermaster, so they didn’t get the food and water they needed. From May 4 to 29, the eighteen men in the boat lived on about an ounce and a third of bread each per day. The boat was so full of men, it sat low in the water. Because it was so crowded, four loyal men had been left behind with the mutineers, who later released them in Tahiti. But those in the launch suffered badly. They sailed through stormy seas, in constant fear of sinking, and nearly starved. On May 29, they sighted an island of the Great Barrier Reef, near Australia. This area was not yet colonized. Bligh sketched maps as they sailed along the reef, through what is known as the Torres Strait, between Australia and New Guinea, and on toward the Indian Ocean. They landed at Timor on June 15. Some of the men died of illness soon afterward, but most of the survivors went on to Batavia (modern day Jakarta) and waited for a ship to take them to England. The cause of the mutiny has never been satisfactorily explained. Though Bligh has been portrayed in fiction and films as an intolerant, even sadistic man, the records say otherwise. While he didn’t suffer fools gladly, he was known as rather an “enlightened” captain, who was concerned about cleanliness, good diet, and exercise to keep his crew healthy. He was not mean, and indeed was slower to punish his crewmen, and with milder sentences, than some other officers of the time. The Bounty had been sent to Tahiti to get breadfruit plants to take to the Caribbean, and they were delayed several months in Tahiti while waiting for the plants to mature before transporting. Many say that the crew simply didn't want to leave the idyllic life they had found in the South Pacific. Much more could be told about Bligh’s life, his later accomplishments, and about the mutiny and its aftermath, but we will leave that for another day. Join the seafaring fun! To enter a drawing for one of Susan Page Davis’s modern contemporary romances with a Navy setting, leave a comment and your contact information. The winner may choose either a paperback copy or an e-book of any book from the Frasier Island series. The titles are Frasier Island, Finding Marie, and Inside Story. Those who prefer historicals can request a copy of The Sheriff’s Surrender instead. The drawing will be held Sept. 28.
winner of the Inspirational Readers’ Choice Award, and also a winner of the Carol Award and the Will Rogers Medallion, and a finalist in the WILLA Awards and the More Than Magic Contest. Visit her website at: www.susanpagedavis.com . I enjoyed this very interesting post about Captain Bligh. The Frasier Island series sounds wonderful. Thanks, Caryl. I always think he didn't get his due. Always love to read about men who rose in the ranks in other countries. Makes me wonder what kind of a person they were. kamundsen44(at)yahoo(dot)com. Thanks, Kim! I love reading about the old explorers and seafarers. That life fascinates me--but I'm glad I don't have to actually do it! They lived in very harsh conditions. Hi, Betti! I guess I had always thought he was in trouble after losing the Bounty, but he had an illustrious career after that incident. An interesting post, Susan - thank you!! I was surprised to read boys were signed up for the Royal Navy at the age of 7 years, and amazed at the facts of that voyage in a 23 foot boat. Thanks for the giveaway opportunity!! Thanks, Bonnie, and glad you remembered so we can enter you in the drawing! Yes, I cannot imagine sending my boys off at age 7. Scary! Thank you for this post. It was interesting reading about Captain Bligh. I didn't know much about him other than the mutiny. I would love to win a copy of your book. Glad to see you here, Susan. He actually wrote an account of the mutiny himself, after he got back to England! Thank you for your interesting post, Susan. You always share great stories! Thanks, Melanie and Sharon. I know! I am SO glad I live in the twenty-first century. Susan, thank you so much for such an informative and interesting post. I never realized how accomplished Bligh was! You're welcome, Connie! I don't think the man was perfect, but I do think he gets a bad rap nowadays. And the winner is Caryl Kane! Thank you all for taking part in the discussion.